SYS vs CV, 40th Match, Bangladesh Premier League 2019. David Warner, Sandeep Lamichhane, Gulbadin Naib and Imran Tahir are not available. R Frylinck if fit will return in the playing XI replacing Dasun Shanaka or Sikandar Raza. ⚠️ This match can be risky as in BPL any player can be rested in any match. 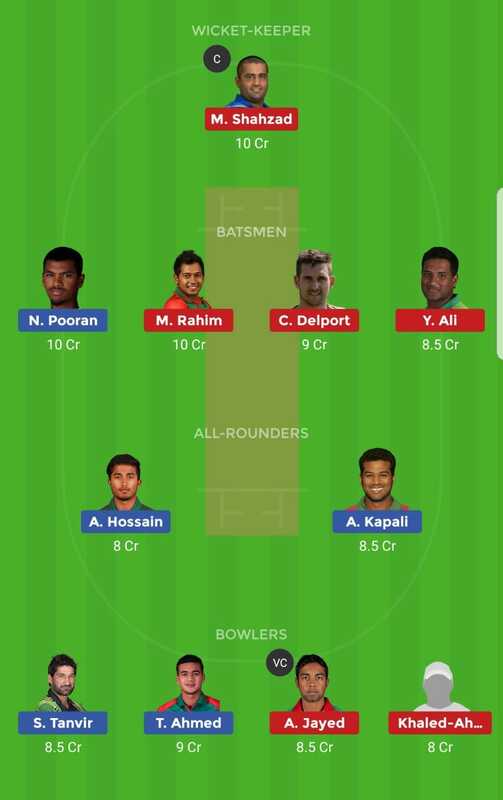 Liton Das (wk), Afif Hossain, Jason Roy, Sabbir Rahman, N Pooran, M Nawaz, Alok Kapali (c), Sohail Tanvir, Nabil Samad/Nasir Hossain, Taskin Ahmed, Ebadat Hossain/Al-Amin Hossain. Mohammad Shahzad, C Delport, Yasir Ali, Mushfiqur Rahim (c and wk), Sikandar Raza/R Frylinck, D Shanaka/R Frylinck, Mosaddek Hossain, Nazmul Hossain Milon/Sunzamul Islam, Nayeem Hasan, Abu Jayed, Khaled Ahmed. You can also pick Shabbir Rehman in place of Y Ali to make balance team.